Chongqing new Yan Da Electromechanical Equipment Co., Ltd. Chongqing new Yan Da Electromechanical Equipment Co., Ltd.
Chongqing Xin Yan Tatsu Electrical Equipment Co. Ltd. is a private joint-stock enterprise, located in Chongqing City East Valley Industrial Park Liangjiang New Area U No. 182, the company was founded in October 2011, is now a registered capital of 10 million 500 thousand, more than 80 employees, mainly in our product design and development, manufacturing and assembly. 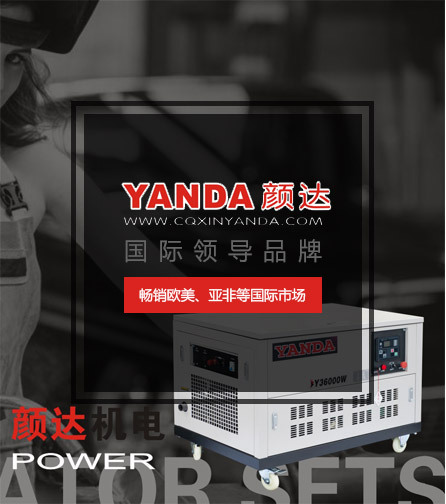 Has a sound detection system, sales network and customer service service: the main production of 2KW-30KW gasoline generator, diesel generator group, 15KW-30KW 5KW-2000KW and low noise gasoline generator, 2KW-10KW EFI Gasoline Generator: 5KW-10KW gasoline generator: 10KW-500KW mute mute diesel generator; 5KW-30KW permanent magnet generator: 200A intermediate frequency electric welding machine, 250A permanent magnet machine; since the start of turbine and generator of cloud monitoring; the products are widely used in communication base stations, banks, hospitals, schools, electric power dispatching and monitoring, railway maintenance, iron construction, petroleum pipeline construction, field forces emergency power supply security, gas pipeline installation and repair, tap water and heating pipeline construction and other fields, and export to many countries in the world, the domestic and foreign customers trust and support.